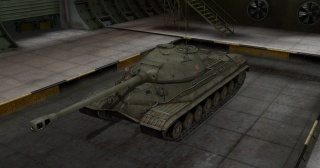 The T-10 is a Soviet tier 9 heavy tank. El desarrollo comenzó en 1949. El vehículo entró en servicio en 1953 bajo la designación T-10. El desarrollo posterior produjo varias modificaciones en el carro, siendo el más fabricado en masa el T-10M. Se produjeron aproximadamente unos 2500 vehículos. 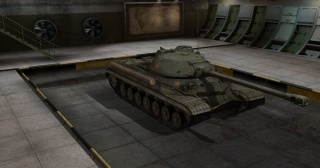 Formerly known as the IS-8, the T-10 is a departure from its "parent", the IS-3, as instead of being a hands-on assault tank, the T-10 is a "softer" but faster heavy tank, comparable to the IS. It drives more like a "super medium" than a heavy. 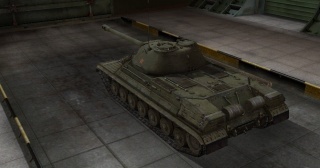 The front armor is slightly increased in thickness compared to IS-3, but it is far less effective in the front due to the worsened angles and increased height of the tank, but the side armour is increased by 30mm and it has spaced armour just like the IS-3. The turret is very hard to penetrate and the center of the front hull is capable of bouncing shots from the direct front, but shots from other tier 9s will often go straight through. The top gun, however, has enough penetration to easily take on other tier 9 and 10 heavy tanks, and does a lot of damage with a quicker reload than the IS-3's BL-9 gun. Using the T-10's speed to avoid damage and pick on other heavies makes this tank an extremely formidable opponent. 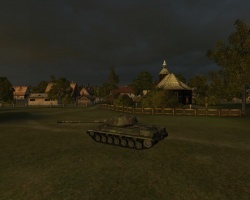 The T-10 leads to the Object 277. 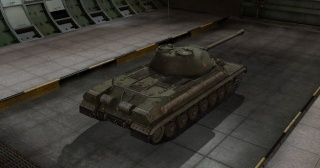 The speed and mobility of T-10 allows you to reach areas in an amount of time only tier 8-10 French heavies can dream of reaching. Use this to your advantage especially if you have the top gun, as it allows you to land early- and potentially game shifting- blows. This also permits you to deal at least three shots worth of damage with the top gun, if you play your cards correctly. The top gun's power is starkly felt from the IS-3's top gun, with 33 additional millimeters of penetration (the IS-7's gun loses 8mm of that pen) knowing where to place shots on other tanks will lead you toward piling up a hearty heap of damage, and even several kills on top of that. However keep in mind you cannot brawl in the manner you could in the IS-3, simply charging in and letting foes hopelessly bounce off the front of your tank. This is because while the front armor of the T-10 is in fact 10mm thicker than the IS-3's, the angles arent any better and as guns at tier 9 have much higher penetration it isnt as effective. Combined with larger lower glacis than IS-3 means that unless foes fire into your front from odd-angles (which can lead to some very lucky bounces), or just lack the penetration power entirely (the IS can hardly pen your front hull at all), you will lose health very rapidly. The best method to remedy this is to adopt a mixture of medium tank tactics and heavy tank tactics. 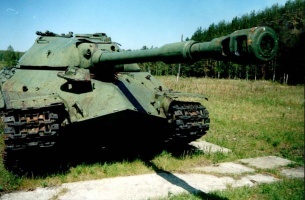 The T-10, aside from the strange angling of the front hull and frequent module damage, can be essentially seen as a larger T-54 with a more powerful gun. The best method of surviving battles whiles racking up damage and kills is to adopt a form of "Peek-a-boom" brawling, popping out of cover or from behind terrain to take pot shots into tanks one on one. You may not have a massive amount of hitpoints for a tier 9 heavy, but a single medium (or even two in some situations) will have extreme trouble defeating you man to man against you if you have the top gun installed. By the time more serious threats such as slower heavy tanks show up, you can greet them with the wrecks of their medium allies, or have essentially eliminated a push opportunity for the enemy. Sidescraping can be tricky since upper plate is not particurarly thick and when angled, it becomes vulnerable to even some tier 8s. Better option is to reverse sidescrape. Frontal mounted turret and spaced side armor makes this actually very effective when mastered. The T-10 also is extremely effective at leading a fast-tank charge down a flank, as the top gun's alpha allows it to finish off targets mediums start trading paint with, or lop-siding such confrontations altogether. All in all, try to stay near cover as much as you can, pop tanks when you have a clear shot, keep your tank as little in the open for shots as possible, and avoid getting encircled by a smaller tank. 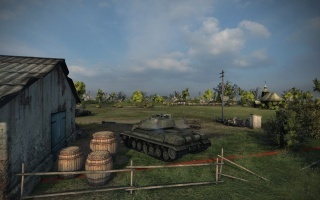 While it might be not as easy to play as IS or IS-3, T-10 is extremely good tank in good hands and still one of the best vehicles in its tier. The 122mm BL-9 gun and the R-113 radio carry over from the IS-3, immediately mount those. From here its the choice of the turret for better gun handling and reload, or the tracks for the ability to mount the top engine and equipment. Reasearch whatever you haven't reasearched. Esta página fue modificada por última vez el 25 oct 2016, a las 13:03.